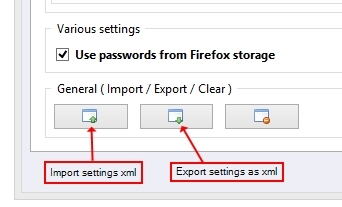 ShareOnVibe is an add-on for Firefox which lets you share any content to your Micro Focus (former Novell) Vibe™ platform easily (Vibe product page). The add-on is a product from co3-tools, the brand for helpful collaboration tools, add-ons and Vibe extensions from Code and Concept. 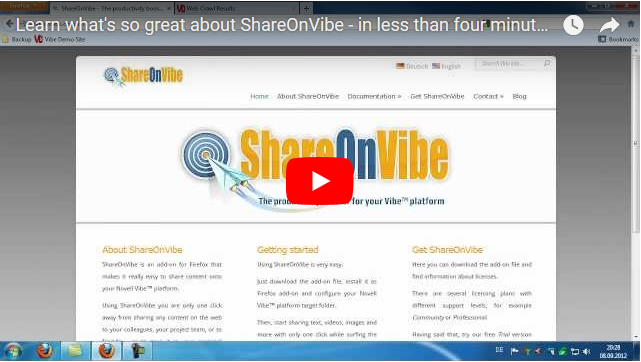 Using ShareOnVibe you are only one click away from sharing any content on the web with your colleagues, your project team, your friends – or saving it to your personal Vibe™ folders. ShareOnVibe is developed to store interesting web content in a quick and easy way while enjoying all advantages of the Micro Focus Vibe™ platform. Content can be tagged with keywords already while sharing it, so it will be easy to find later on in Vibe. Text, Links, Pictures and Videos are displayed in the appropriate Vibe folders. Being extremely extensible and customizable, Vibe satisfies any requirements on social collaboration tools, especially for business use. Use cases for Vibe include team collaboration, knowledge management, document management, enhancing your business processes, building intranet portals and much more. With this collaboration platform teams can share all of their information about projects and processes in one single, secure place. Vibe offers an easy way for communication with team members, commenting on other’s entries or tagging content to manage and structure it. For more information about Micro Focus Vibe™, please visit the Vibe product page. ShareOnVibe automatically adds the necessary meta information, including the browser window title and a link to the source page you shared from. Managing and retrieving shared content – ShareOnVibe has some useful extra features to make life easier! Tagging: Tagging content can already be done while you share it, using “personal” or “global” tags. Access Vibe folders directly: Via right click you can open the context menu and use the “Open Vibe Folder” function to instantly open a configured Vibe folder in a new browser tab. Access to Vibe entries you shared: ShareOnVibe keeps a history of the entries you shared. 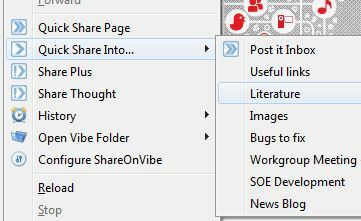 Open the context menu via right click, choose “History” and select the recently shared entries to directly view or modify them. Commenting and meta-information: Using “Share Plus”, you can add a comment or description and tags to the information you are sharing, making it even easier to find them in Vibe! You are doing research for education, for work, or your own project? You are tired of storing and organising bookmarks that you cannot tag, describe, or take with you? Tired of using yet another desktop tool and want to use Micro Focus (former Novell) Vibe™ but don’t like having to navigate to the Vibe platform all the time? ShareOnVibe lets you drop your results directly into your Vibe folder without leaving the web page you’re on. Using the option Share Plus you can tag the information, write a short comment, and share away! Further applications can be found at Use Cases of ShareOnVibe. Do you tend to write down ideas, thoughts, todos, phone call notes, reminders, all kinds of information on pieces of paper and on Post-it notes, sticking them all around your workplace? 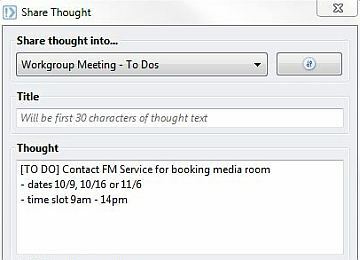 With ShareOnVibe, you can easily and simply share a “Post-it” via the “Share Thought” function! Enter a title, a text, tag it right away, and share it into Micro Focus (former Novell) Vibe™ – making the information permanent, searchable, and – if you use a private folder – safe from prying eyes! No co-worker sees your notes, no friend or spouse can see the nice gift idea you just had for them – they could if you wrote it down on paper, but not with ShareOnVibe. Sometimes you find remarkable pictures of an event, search graphics related to a certain topic or watch a great YouTube video while surfing the web and want to collect or share them with others. With ShareOnVibe you directly post pictures into a Vibe photo album or embed videos in Vibe entries – without downloading, saving and uploading them again. It’s just one click! By the way, in your private Vibe folders only you can see the shared pictures and videos. Your new colleague has just started to work with you and is currently getting used to Vibe and ShareOnVibe. Why don’t you give him your ShareOnVibe configuration for the start so he can use the most important folders? Just right-click, choose “Configure ShareOnVibe” and export your configuration. Then import it to your colleague’s ShareOnVibe – your colleague will have a good start and get to know the most important tools of your team easily!